In the summer, a square of shady grass or a city terrace will encourage you to bask in the sun. To enjoy the sunshine in the most comfort, choose your garden furniture elements according to our taste, and also to suit how you want to use it. A small area does not limit your comfort. For small spaces, such as a small patio or an apartment terrace, it is possible to match a side table with a relax armchair to enjoy the sunshine in comfort. Relaxing chairs ensure the user’s comfort with their multi-position reclining backrest, armrests and a headrest that can be modified as needed. Usually made from canvas or breathable fabric, this type of chair is perfect for a moment of relaxation, either seated or lying down. Easy to fold, it can be stored away without taking up much room. A large garden offers more space for the imagination. Beyond the dining set with an outdoor table and chairs, there is value in designing a relaxation area under a sail shade, with a lounger or a sunbed to combine with a footrest. A true symbol of relaxation, this modern deckchair has various positions for total well-being. As light as it is sturdy, it is as easy to move around as a folding chair. To liven up the poolside area, just combine comfort and design. In the shade of a tilted sunshade, the cool water calls you to relax on sunny days. 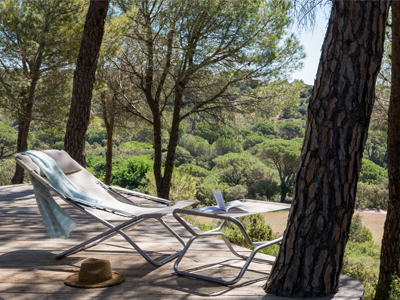 For a calming siesta, the sunlounger made from canvas offers unique ergonomics. 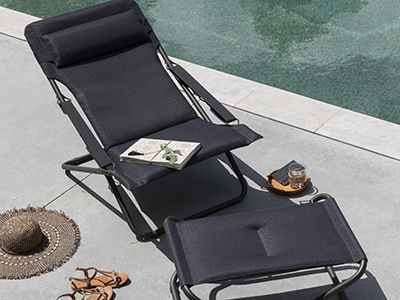 Clipped fabric, an innovation developed by LAFUMA Mobilier, offers excellent back support, and the moveable backrest even provides a completely flat position for optimum sunbathing. With its high quality weave, the furniture does not become distorted, and maintains its initial shape. The sun lounger does not mind splashes because of its open-weave fabric, which guarantees optimum breathability and is quick-drying. A steel frame resists rust, as long as the metal is treated and protected with a quality paint finish. Otherwise, aluminium is the unbeatable material. 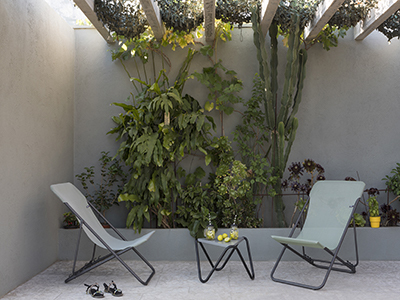 This outdoor chaise longue which combines aesthetics and technical details is available in various calm and elegant colours, from anthracite grey or ecru to more dynamic colours such as lagoon blue. Depending on the space available and the number of people using it, it is possible to arrange several sun loungers so as to match colour shades, and also to brighten up this outdoor space with a deckchair or swing seat, hammock or outdoor pouffe, depending on the look required. The different varieties resist moisture and also sun damage. Acacia, pine and eucalyptus, and also tropical wood such as solid teak are rot-resistant. It is advisable, however, to treat your garden furniture set with linseed oil every year. Wooden furniture, with its timeless style, offers a cosy look, but it requires regular maintenance. Also, the weight of a wooden rocking chair or garden chair is a drawback. An outdoor living set made from wicker may offer an alternative, but is not suitable for all uses. Opaque or transparent, shiny or matte, resin has become one of the trends in decor. These models, given their scale, are more suited to a large area. Easy to maintain, this material which usually covers a steel or aluminium frame, is designed with a wicker style which resists bad weather and UV rays. On the other hand, it is advisable to add an outdoor seat pad or cushion to make the seating as comfortable as possible. Worth noting: this type of outdoor furniture requires a certain level of investment if you are looking for quality, lasting furniture. Wrought iron is beloved for its romantic looks, but is not suitable for retricted areas such as a city balcony; its considerable weight being a problem. An aluminium garden set is less sturdy, but easier to move around. Designed for a streamlined look, a metal low armchair or dining chair, with a frame made from epoxy steel or lacquered steel has the advantage of being resistant to both UV damage and rust. As for HLE alloy (High tensile) developed for the auto industry and used by LAFUMA Mobilier, it combines strength, lightness and durability. A plastic garden furniture set should be stored during bad weather as it could be blown away. While it is appreciated for its great lightness, plastic furniture is not necessarily stackable and rarely foldable. It is available in a wide choice of colours, from the more traditional shades to more pastel and colourful tones. Stylish garden furniture is subject to somewhat harsh conditions, from prolonged exposure to the sun to rain storms. In order to ensure it lasts a long time, it is essential to opt for quality materials that will be durable. LAFUMA Mobilier products, designed for outdoor use and equally at home indoors, are, for example eco-designed and recyclable. Their fabric carrying the Oeko-Tex® label is certified free from substances which are toxic to humans and the environment. It guarantees excellent resistance to UV exposure, does not lose its shape, dries quickly, is resistant to ripping and abrasion as well as to mildew due to an anti-fungal treatment. 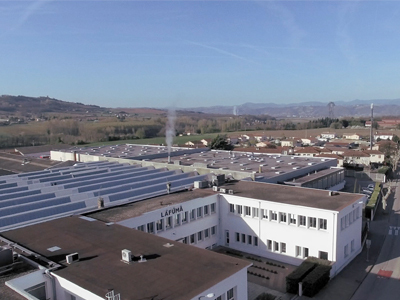 LAFUMA Mobilier products, made in France, are built on more than half a century of knowledge and experience. In addition, to guarantee quality customer service, LAFUMA Mobilier offers a range of replacement parts. Every product can therefore enjoy a second life, thanks to the line of replacement parts. With a wide selection of coloured fabrics, it is easy to renew your outdoor look in an instant, however you choose, and at a very low cost.